Disadvantage of the standard technology for the preparation of bakery products are the homogeneous organoleptic and biochemical properties of the products and the narrow assortment, which have negative impact on the consumer characteristics of the bakery products. Furthermore, this technology does not provide for the use of broad spectrum of plant raw materials, which are rich in biologically active substances and functional purpose. The use of plant raw material additive containing a complex of biologically active substances allows to improve the production technology and to obtain bread of functional purpose. We therefore offer a new original technology for producing enriched bakery products by the use of additives which allow to regulate the protein-carbohydrate and vitamin-mineral status of the product thus yielding a variety of bakery assortments which are distinguished by their high nutrition and biological value and have very good organoleptic and biochemical properties [1, p.237-243]. As a natural plant raw material for enriching the bread with protein and other nutrients flour of dry chickpea has been used. The purpose of this work was to develop technology for producing bread of higher nutritional value, so that the wheat flour in the formulation of the reference bread was successively replaced by flour of dry chickpea in the amounts of 10 to 30%. In order to obtain the reference bread, wheat flour type 500 produced by Sofia Mel company has been used. The quality of the bread is determined by the following indicators: bread mass, bread volume, specific volume and organoleptic assessment. 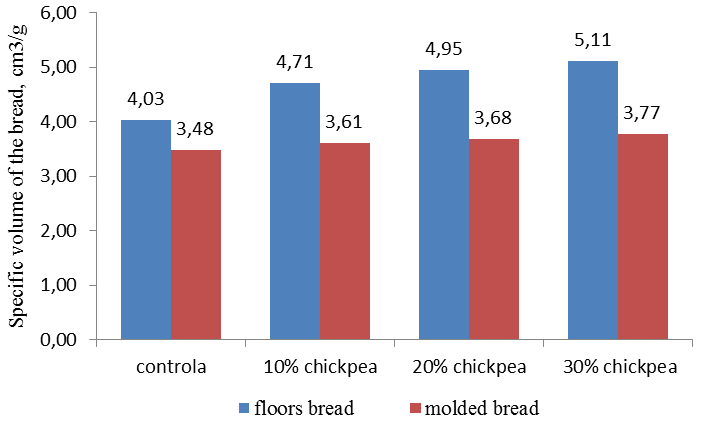 The results from the test laboratory baking of the reference bread (flour type 500), and all flour mixtures with added different percentages of chickpea flour are presented in Figures 1 ÷ 3. The mass of the pan baked and mould baked bread obtained from all flour mixtures containing the chickpeas flour additive, has slightly changed from 3g to 10g compared to the mass of the reference sample. The volume of the pan baked bread and mould baked bread obtained from all flour mixtures containing additive of chickpeas flour has been increasing compared to the volume of the control bread. The greatest difference in bread volume has been observed in the test sample obtained by the use of 30% additive. The specific volume of the pan baked bread and the mould baked bread produced by all flour mixtures with added chickpeas flour of chickpeas has been increasing compared to the specific volume of the reference bread. The titratable acidity of the reference bread and the bread enriched of chickpea, in different amounts of the additive, has been determined. Titratable acidity of the enriched bread crumb is higher than that of the control bread. The increase in acidity is smooth and proportional to the increase of the additive quantity. This is probably due to the presence of organic acids in the additive. Humidity of the reference bread crumb and the enriched bread crumb after baking has been determined at the 24th, 48th, 72th and 96th hour of its storage. The results obtained are given in fig. 4. 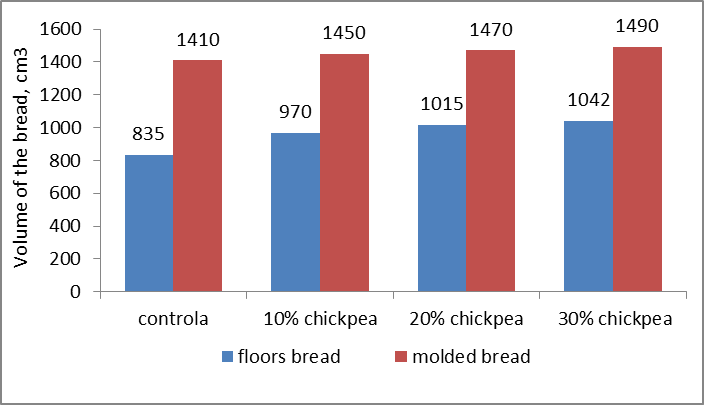 The results in Figure 4 show that the crumb humidity of the bread samples produced of flour mixtures containing chickpea additive is preserved after 24, 48, 72, 96 hours after baking. Studies of Anton AA,.. 2008 in support of our results [2, p. 33-41]. Therefore, the additive preserves the freshness of the bread during its storage for a longer period of time. The sensory evaluation of the resulting bread has been determined on the basis of 10 indicators — appearance, bark color, crumb color, porosity, stickiness, elasticity, flavor and odour, aftertaste, shape stability (H/D) and volume. The general organoleptic assessment of the analyzed samples is presented in Figure 5 and 6. It is evident from the figures that the pan baked bread and the mould baked bread of flour type 500 has a lower average sensory evaluation compared to that obtained of all flour mixtures with used additive. Therefore the additive positively influences the quality of the bread . The pan baked bread and the mould baked bread produced of flour type 500 and all flour mixtures containing additive of dry chickpeas flour has a good appearance, regular shape, smooth crust, without bubbles and cracks. The color of the bread crust does not change with the increase of the additive quantity. The color of the bread crumb is uniform and does not change with the quantity increase of the additive used. Crumb porosity of the bread prepared of flour type 500 and of that prepared of flour mixtures containing additive of dry chickpeas flour is uniform. The pores are thin-walled and mixed – small and medium. Porosity does not change and remains sufficiently uniform with the increase of the additive amount. The bread prepared of all flour mixtures containing additive of dry chickpea flour has elastic crumb without stickiness. Elasticity is increased with the increase the additive amount. Flavor and odour of the bread prepared of all flour mixtures is normal. The resulting bread has no any specific flavor. Pan baked bread and mould baked bread enriched with dry chickpea flour have similar or higher values of their properties volume and specific volume than those of the reference bread. The titratable acidity of the crumb of the enriched bread is higher than that of the reference bread and increases gradually with the increase of the additive amount. The elasticity of the crumb of the enriched bread increases with the increase of the additive amount. The bread crumb is most elastic when the amount of the used dry chickpea flour additive is 30%. The aditive preserves the freshness of the enriched bread for a longer period of time. The bread samples are of very good quality. Most enriched with biologically active substances is the bread containing 30% dry chickpeas additive. Sànches-Vioque, R., R. Clemente, A. Vioque, J. Bautista, J. Millàn, (1998). Protein isolates from chickpea (Cicer arietinum L.): chemical composition, functional properties and protein Food Chemistry. Vol. 64, p.237-243. Anton, A. A., K. A. Ross, O. M. Lukow, R. G. Fulcher and S. D. Arntfield, (2008). Influence of added bean flour (Phaseolus vulgaris L.) on some physical and nutritional properties of wheat flour tortillas. Food Chemistry, Vol. 109, p. 33-41. Recipes and technologies for the preparation of high quality bread based on wheat flour type 500 by the use of different amounts of chickpeas flour (10%, 20% and 30%) as a proportion of the flour mass have been developed. Based on this, test laboratory bakings of bread have been performed. Finished products were qualified by their organoleptic properties (appearance, colour of the bread bark, colour of the bread crumb, porosity, stickiness, elasticity, flavor and smell, aftertaste) and physical quality parameters (mass, volume, specific volume). It was proved by the results obtained, that the quality of the resulting bread is very good. The titratable acidity and humidity of the crumb of the enriched bread has been determined, which showed that the additive used keeps the freshness of the bread for a longer period of time.